Dining Services is a full-service dining operation for the entire campus community — students, faculty, staff, alumni, parents, and campus guests. We operate three dining halls, two snack bars, and a grab ’n go lunch program in addition to the Faculty House/Alumni Center, a catering operation and vending. Each of our operations has its own unique style, but a commitment to “Dining with Pride” is shared across our entire department. In conjunction with the Humane Society, Williams college has been working with the Forward Food project to bring more robust Vegan and Vegetarian options to our Dining program. This is a video of that training. A meal dedicated to the Asian Carp epidemic and cleaning them out of the Mississippi river. Our 100+ employees are dedicated to preparing and serving healthy, nutritious, flavorful meals — rain, snow, or shine. Our outstanding customer service is a point of pride for everyone in the department. We purchase only the finest ingredients from nationally branded and reputable suppliers. We are also committed to buying local, fresh food whenever possible, and are members of Berkshire Grown, an organization which promotes sustainable agriculture. We offer a flexible system of Meal Plans. The 21-Meal Plan allows 10 guest meals each semester, and if you miss dinner, the Full Meal Plan allows you to use your meal credit Late Night in Whitmans’ and the ’82 Grill. The 14-meal plan allows you to take any 14 meals offered and 6 guest meals each semester. There is also a 5-meal plan and a 50-meal block plan available for off-campus & co-op students. All students on Meal Plans may participate in special events such as the annual Harvest Dinner and the Recipe from Home contest. If you have any questions, please feel free to call the department at 597-2121, or visit our administrative offices in Droppers House at 15 Park Street. Get your family’s favorite onto Williams dining hall menus. Submit your Recipes From Home! Find out what’s on today’s menu! Your comments are appreciated and help to make our program stronger. Thank you for your feedback. Apr 21 – Sunday Easter Brunch, Special Menus, All Units. April 22 – Monday Earth Day, Official Calendar Day, Special Programming with Zilkha. Dining Services is pleased to announce some valuable additions to the student meal plan, along with the GET App to manage your card accounts. The GET App is available for points purchases and to view your balance on your meal account. Two swipes per mealtime are available at the start of the fall board plan with dinner on September 5, 2018. Lee Snack Bar Midday Meal Equivalency: If you’re on the 21, 14, 5, or 50 block meal plans, you can now use full meal equivalency at Lee Snack Bar between 2:00 and 5:00 p.m. every day. Check out the new GET App! : With GET, you can manage your campus card accounts anytime, from anywhere. Features include: secure credit card deposits to your Eph Points account; the option to bill your deposits to your student term account; and access to your real-time account balance and transaction history. It’s an easy, convenient, and secure way to manage dining funds. These funds will be available immediately on your card. 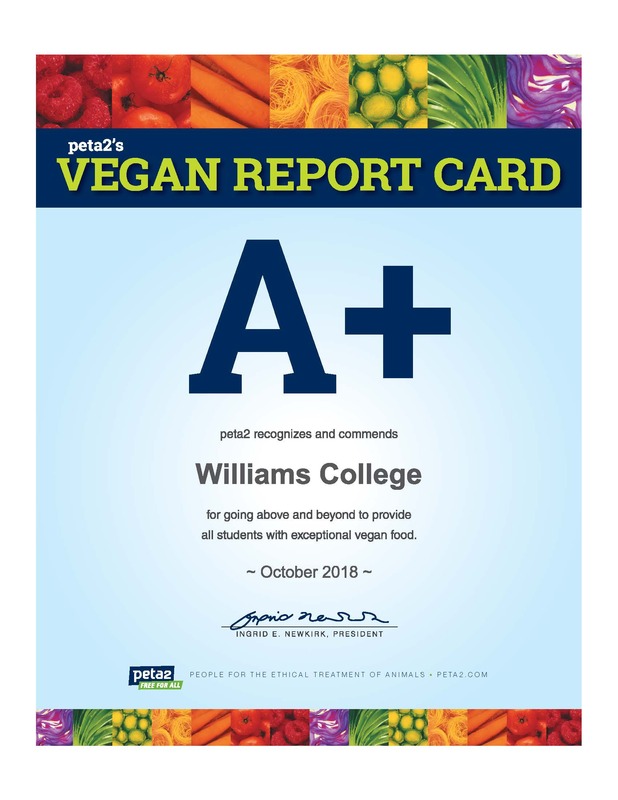 For more information visit our website: https://dining.williams.edu/get-app/. We designed these changes to make the dining options more flexible and adaptable to student lifestyles. Have a comment or idea you want to share? Send it to [email protected] We want to hear from you. Cash and Eph Points are accepted at all venues. Master Card, VISA, and Discover are accepted at all venues except Paresky Grab and Go. 82 Grill and Whitmans. The service cut-off time is 1am AT THE REGISTER. Lee Snack Bar on Friday and Saturday Nights.The service cut-off time is 2am AT THE REGISTER. New Hours for Whitman Late Night Snack Bar – now opens for service at 9pm. As usual, 82 Grill and Lee Snack Bar open at 8:30pm. New! Make Your Own Pasta Dish at 82 Grill. Includes salad, bread and fresh fruit.